Currently working on fractiles, fun, random images. Fern’s hand drawn art and digital art are displayed in this website. Above is a layered Photoshop image, four original photos by Fern, (transparent about 50%) including two of a hiking trail, one of the moon, and over all is Fern’s face looking skyward, done in grunge style. 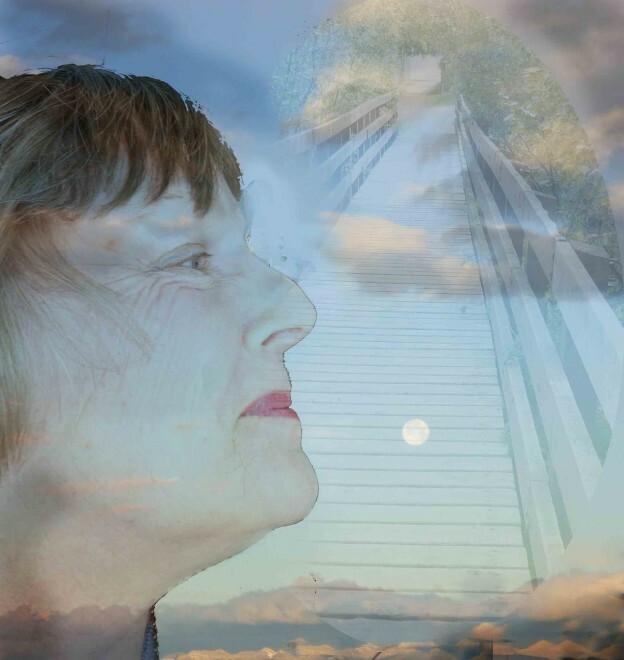 Fern Phillips is a fine art and digital art creator, and also a creative writer. Fern is at home with creativity. As a long time hobby artist She dabbles in learning new techniques and media. Watercolour, oils and pen and ink are the current interests. She enjoys collage and art journal techniques. She learns technical skills with pencil and ink in order to not have to use them to ‘prove’ her ability, since she also loves doing abstract imagery. Art with a western theme are in-line with her background. She believes in art for all, and that anyone is able to be creative. Visit her digital art Gallery and/or her hand done art at the Portfolio page.